Since launching our Pennsylvania Program at the beginning of 2018, we’ve been hard at work organizing solar co-ops across the western part of the state. Currently, we have open co-ops in Allegheny County, Cambria County, and in Washington and Greene Counties. Additionally, we expect to be launching one in Crawford County soon! These solar co-ops are a unique opportunity for individual homeowners and small businesses to go solar, gain energy independence, and save lots of money on electricity. Our solar co-ops can also have powerful, transformative effects that go far beyond the individual households and businesses who go solar. Brian Wolovich, Millvale Borough Council member and partner on our Allegheny County Solar Co-op agrees. 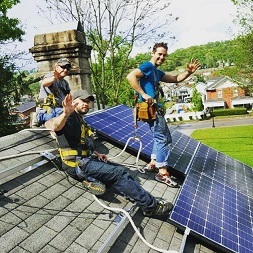 “Investing in solar today means creating solar jobs for our neighbors and taking the next step towards energy independence, all while making Allegheny County cleaner and greener,” says Wolovich. 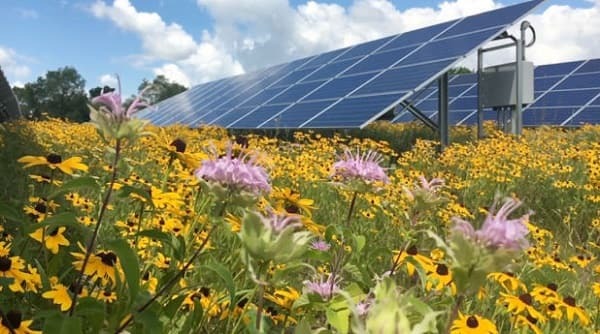 As more Western Pennsylvanians go solar through our co-ops, the region will begin to see economic, environmental, and electrical grid benefits that are enjoyed by everyone, not just co-op participants. Plus, co-op participants don’t just go solar—they become effective advocates for a cleaner and fairer energy system. Distributed solar is unique among energy sources in how it benefits local and regional economies. Traditional sources of electricity generation, like coal and nuclear plants, are usually owned by large corporations and shadowy investors from far away. When these utilities turn a profit, its investors, not the local communities they serve, who get more money in their pockets. But with distributed solar, the owner of that miniature “power plant” is you or your neighbor. The financial benefits of that power production are largely local. Similarly, the solar installation industry is becoming increasingly dominated by smaller companies who work regionally or locally. That means that when they get more business, the profits they earn and the jobs they create benefit local communities. Our co-ops give a boost to the installer market by turning solar-curious people into satisfied solar owners. And this effect is not limited to just co-op participants and their selected installers; in areas where we have run co-ops, we’ve seen a ripple effect where unaffiliated installers enjoy an increase in business that can last up to a year after a co-op ends. The solar industry broadly—from design, to manufacturing, to sales and installation—is becoming an increasingly important employer, both nationally and in Pennsylvania. In 2017, solar jobs grew by 26%, in Pennsylvania. Nationally, solar installer is the fastest growing occupation in the country, according to the Bureau of Labor Statistics. Everybody knows that solar is a clean energy source. And though some detractors might point out that solar panel manufacturing requires energy, solar panels have already saved more energy than was required to produce them. Solar detractors often make the claim that distributed solar saddles non-solar ratepayers with extra costs as those solar owners buy less electricity, and therefore pay less for grid maintenance and upgrades. However, the data shows the opposite to be true! Two years ago in California, where solar is widespread, 41 expensive transmission projects were either canceled or revised due to residential solar power and energy efficiency improvements. By generating energy at or close to where it is used, distributed solar reduces the need for transmission infrastructure to carry energy from distant power plants to our homes and businesses. That means fewer costs for utilities to incur and then pass on to their ratepayers. Our co-ops don’t simply help people go solar, but help transform them into informed, organized, and connected solar supporters. Through our information sessions, educational resources, and advocacy initiatives, we provide the tools and infrastructure to turn solar owners into a potent force for change. We continue to see this play out in states where we launch co-ops. 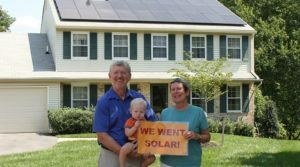 As more co-ops create more solar owners, those solar owners can fight successfully for better solar policies at the state and local level. These policy wins create a snowball effect—our past co-op participants lower policy barriers that enable more people to go solar, creating more empowered solar advocates, who can in turn push for more policy wins. The future in Pennsylvania is sunny! We are looking forward to launching more co-ops across the region as our program grows. If you want us to come to your neck of the woods and launch a solar co-op, reach out to pateam@solarunitedneighbors.org!